White Horse District Klondike Winners! 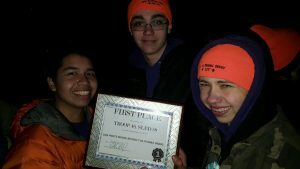 Congrats to the Phoenix Patrol – John, Stephen, and Magnus – for winning the 2017 White Horse District Klondike Derby! They beat out 25 other patrols from 18 other Troops from all over Camden County. The Beaver Patrol also took a major step up in the standings from last year, which was great. Overall, it was a fun day for all involved! Big thank you to all the adults from the White Horse District who made it such a great day! We also had a great write up on the event in The Berlin Sun. Thanks to that fine paper for coming out to the Klondike!